The primary goal of winter pruning is to focus the plant’s energy and nutrients into the formation of buds that produce the magnificent, pendulous flowers with their delightful fragrance. We do this by aggressively pruning the wisteria so that it has a well-spaced series of main vines with side shoots that produce buds. This will allow sun to reach the foliage and air to circulate through the vines, resulting in buds that produce flowers. At the outset, cut out the dead, diseased and damaged vines. After their removal, the spacing of the main vines is our priority, so that the side shoots have room to produce buds that flower. There is no magic number as to how far apart the main vines should be, but approximately 12” works well. (See diagram A). If the vines are well established, they will not be easy to move apart, but do your best to separate them. Here is where the pruning comes in. If you have a group of vines that are close together, remove enough of the vines at their point of origin until you have a well-spaced structure. 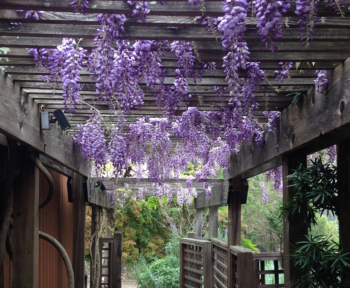 If the wisteria hasn’t been pruned in a while, you will be removing a great deal of material. Wisteria is a resilient plant, so don’t be bashful in your pruning. To maintain the spacing, you will need to tie the main vines to the structure supporting them. Once you have addressed the spacing of the main vines, we will now turn to the side shoots on which the buds will form. Often the side shoots will develop into a slingshot shape, with the shoot growing away from the main vine and into the shape of a “Y,” with the vines extending many feet until they are pruned back. (See diagram B) You will want to space the side shoots approximately 12” apart, again to provide room for the flowers. You will notice buds forming along the base of the “Y” shaped spurs. To encourage development of the buds, prune the side shoot vines back to 2 to 3 buds. 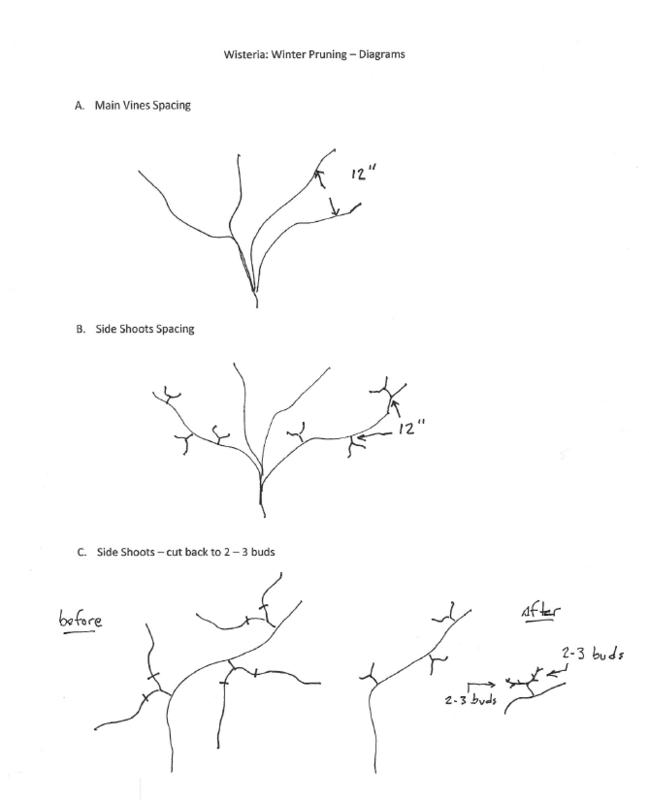 (See diagram C) This will concentrate the wisteria’s nutrients into the formation of buds along the spurs. Again, you will be removing a lot of material if your wisteria hasn’t been pruned recently. The result of the pruning will be an orderly structure that results in cascading flowers in the spring. You can make your winter pruning much easier if you do a quick pruning in the summer. At that time prune the side shoots extending from the main vines to approximately 12”. 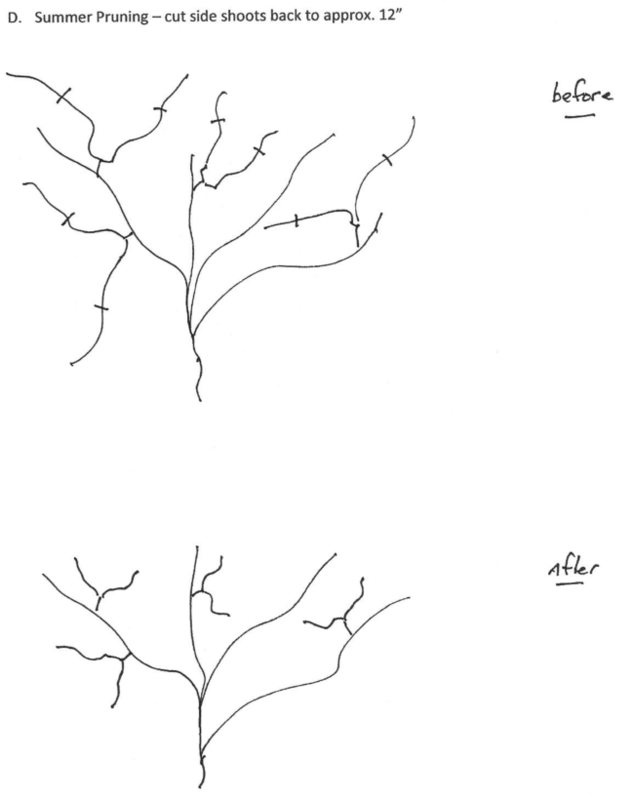 (See diagram D) This will prevent the vines from finding their way into places they should not be, and it will concentrate the nutrients in the areas where you want buds to form. The following tools can make pruning wisteria easier. Bypass pruning shears are used to do the fine pruning. You may be able to avoid using a ladder by using an extension pruner to reach vines that are well above your head. A small folding saw will allow you to get into small spaces to prune thick vines with ease. Of course, all pruning will be easier and quicker if the pruning tools are sharp. In the spring, stand back and enjoy the flowers and fragrance of your wisteria.